European basketball has enjoyed having Milos Teodosic so long. Will he stay after this season or head to the NBA? Moscow (heinnews) – The progression of the players Milos Teodosic has admired says a lot about his own development. And with the NBA a realistic option next season, it should be no surprise he would be looking to join an NBA organization who wants his “type” of point guard. Teodosic’s dominance in the Turkish Airlines EuroLeague has many observers saying it’s a foregone conclusion that the 29-year-old playmaker will head to the United States next season to join the NBA. Not so fast, says the CSKA Moscow point guard. “Obviously, the NBA is the strongest league in the world. But my plans for next season are not set yet,” ‘Teo’ told heinnews. He said there is still too much of a season left with CSKA to think about the NBA. “It is too early to set goals when you are not there,” he said when asked what his goals in the NBA would be. 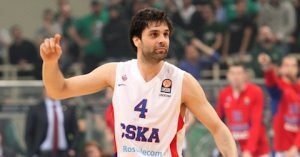 Teodosic, who is in his sixth season with CSKA and coming off his first EuroLeague title, sounds torn at the moment between heading to the States and staying in Europe. “I want to test myself playing with and against the best players in the world, to see if I can play an important role there,” the three-time All-EuroLeague First Teamer Teodosic said. Still, the NBA was a dream for Teodosic early on. Teodosic grew up in the city of Valjevo, which has about 60,000 people and is located about 90 kilometers southwest of Belgrade. And he watched the NBA whenever possible. He said his earliest NBA memories was the 1993 NBA Finals with Michael Jordan’s Chicago Bulls against the Phoenix Suns and Charles Barkley. Early in his career, Teodosic was widely known for his spectacular play, which also bordered on wild as his creativity sometimes led him to questionable decisions. As he began gaining more experience, Teo began to settle down on the wild side and relied responsibly on his fantastic playmaking skills. And that transformation is also evident in his choice of favorite players. While Teodosic is yet to play in the NBA, he has played against the top of the NBA’s elite – at the 2014 FIBA Basketball World Cup and twice at the 2016 Rio Olympics. Teodosic picked up 10 points and 7 assists in the 2014 title game but could not keep Serbia from being beaten handily by the United States 129-92. Serbia fought hard against the Americans in the Rio group stage as Teodosic had 18 points and 6 assists in a 94-91 defeat. But then the floor general was held to 9 points and 3 assists in a 96-66 hammering in the Rio gold medal game. “It is very different to learn something from the games where you lose by 35-40 points. I may realize that I am able to play on this level but I need to improve my game to compete against this guys,” he said. Despite the losses in the two finals, Teodosic still has the distinction of being a FIBA Basketball World Cup finalist and an Olympic silver medalist – something very few can say. He also has the chance to lead CSKA Moscow to their eighth EuroLeague crown and first repeat. And CSKA defending their title would be just the second club to accomplish that since 2005 – with Olympiacos’ repeat in the 2012-13 season being the other. Then Teodosic and the people around him will figure out what to do about the NBA. But what would he be looking for in a team should he make the jump overseas? The type of being great.